Saigon (officially known as Ho Chi Minh City) is the largest city in Vietnam and the business centre of the country. The whole city is vibrant and full of character. Everywhere you will see street vendors, office workers, businessmen and the hectic traffic. Chic new cafes and bars, high rise office buildings, hotels, apartment blocks, colourful shops and markets, temples and pagodas - you will find them all in Saigon. 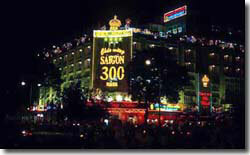 The most popular location for tourists in Saigon is District 1 in the centre of the city. 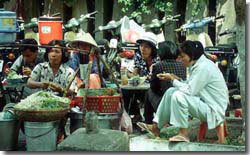 You will find many hotels, restaurants, shops and Internet cafes in this area. To the south-west is District 5, Cholon, the Chinese district. The Zoo and Botanical Gardens on Nguyen Binh Khiem make a pleasant change from the bustle of the city, and can be combined with a visit to the nearby history museum. Ho Chi Minh Museum at Nguyen Tat Thanh in District 4 houses many of Ho's personal effects. It is from here that Ho Chi Minh left Vietnam in 1911 beginning 30 years of excile.